First good king and longest reign 41 yrs so far. Today we are going to cover what was happening in the last 13 yrs of Asa reign. In the thirty-sixth year of Asa’s reign Baasha king of Israel went up against Judah and fortified Ramah to prevent anyone from leaving or entering the territory of Asa king of Judah. 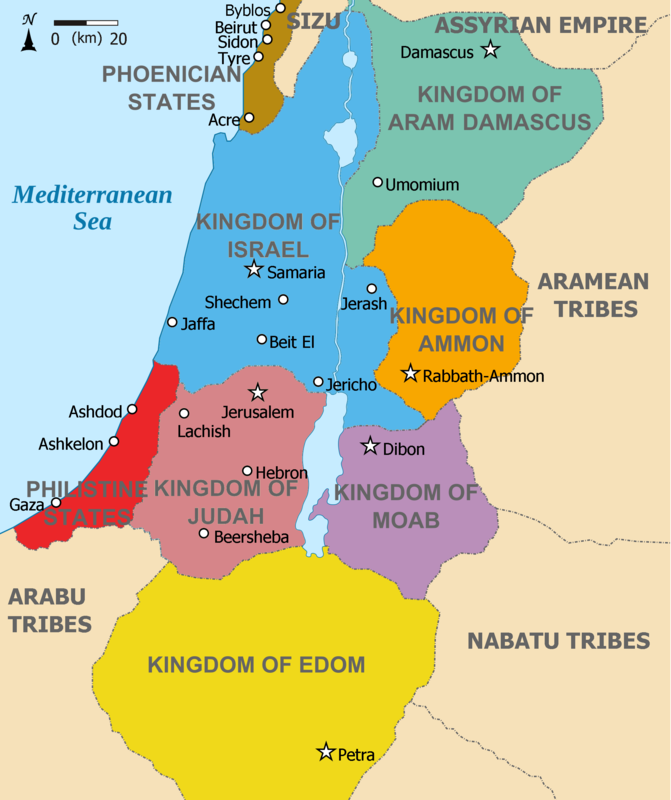 4 Ben-Hadad agreed with King Asa and sent the commanders of his forces against the towns of Israel. 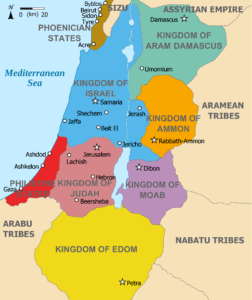 They conquered Ijon, Dan, Abel Maim and all the store cities of Naphtali. 5 When Baasha heard this, he stopped building Ramah and abandoned his work. 6 Then King Asa brought all the men of Judah, and they carried away from Ramah the stones and timber Baasha had been using. With them he built up Geba and Mizpah. Today we will look at the downfall of Asa’s reign. 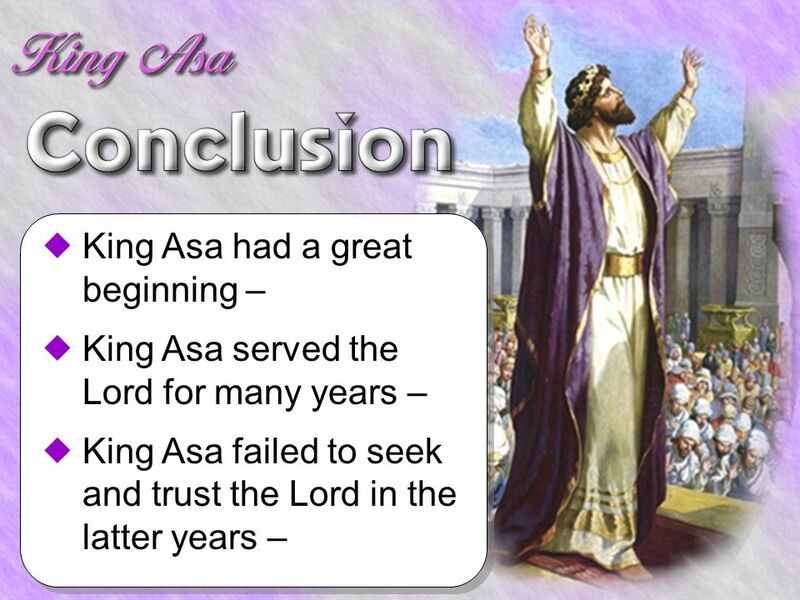 Asa was the first “good” king, but he was not perfect. In fact we see in the end of his life we see he does some things that are downright wrong sinful and evil. So how can the scriptures declare him a good king? Because sin does not determine whether we are good or not. This is the challenge we all have. We base goodness on actions, if someone does something sinful or bad, we say that that person is not good. Or if someone does something we see as helpful and right we deem a person to be good. But that is not how God measures a life. Remember God is not looking for perfection, he is looking for those who are surrendered to Him. Also remember we are looking at these kings within a very specific perspective. How they contributed or reversed the direction of the hearts of the people of God toward following God. 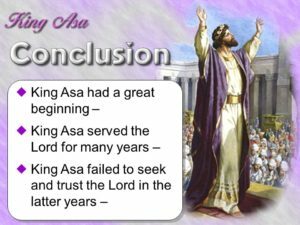 Asa is viewed as a good king not because He did everything right, He is viewed as a good king because He led the people of God to follow God and destroy the false worship of idols. Ray Stedman in a study on Asa said it this way. To put this in present-day terms, what King Asa did was to clean out the adult bookstores, close the massage parlors, confiscate all the pornographic films, close the adult movie theaters, jail the drug pushers, and restore the reading of the Bible and public prayer in the schools and the courts of the land. But unfortunately he was also infected with something, not just in his feet, it was in his character. The infection was competency. Dr Randall Smith Pastor and Bible teacher said it this way. “He began to read his own press and started to rely on his reputation of goodness, rather than his heart for God”. The hunger for God and growing in him can not be replaced by mere knowledge about God. Knowledge is no substitute for growth. The greatest challenge we face is when we think we can do something with out a full reliance upon God. When we become competent and able to handle a problem or situation without first turning to God and asking Him what we should do. When we trust in our own competence and abilities that is where we fail. When we believe we can do anything without God we become dangerous. Confidence in your competence lead to arrogance. If you remember 2 weeks ago we looked at how Asa dealt with a test of trust. He had an army of 580,000 but he faced an army of 1 million. Asa put his trust in God to protect and fight the battle for him. 2 Chronicles 16:1 says In the thirty-sixth year of Asa’s reign Baasha king of Israel went up against Judah and fortified Ramah to prevent anyone from leaving or entering the territory of Asa king of Judah. Now Ramah was a town of Benjamin. So Baasha goes down into Judah and captures one of Asa’s crucial border cities. And how does Asa respond to this threat? God send another test. Something we need to learn about testing. God send tests to us to show us areas that need to be strengthened and surrendered to Him. Test are not from God so that God can find out how we will respond. God already knows that. God sends tests so that we learn how we will respond. Asa prayer in Chapter 15 is forgotten. Why the difference? This was a smaller trouble, i think it was because it was a smaller trouble Asa thought that he could manage it all by himself. Many believers behave worse in little trials than in large ones. I have seen some children of God who have lost almost everything they had, and they have come through those things like champs, but then the littlest thing will trip them up. They will have a harsh word said to them by someone and all of the sudden they fall to pieces. If I am honest I fall into that category all to often. Why is it that this is true? Because of a the disease of competency. It only proves this, that it is not the severity of the trial that determines success or failure, it is the having or not having of God’s presence that is the main thing. So how does Asa respond? 1. He makes a covenant with an unbeliever. He goes out and unequally yokes himself to an unbeliever to create a problem for someone else instead of trusting God to solve his problem. Who does he seek help from Ben-Hadad. The Kingdom of Aram. Goes past the north to Syria. Here we see a child of God teaching the ungodly to be unfaithful — a man of God destroying his testimony by teaching an unbeliever to break his promise. This was political expediency. This is the kind of thing which the kings of the earth practice towards one another. We cannot act like the world and convince ourselves that we are following god. When we become self reliant we can justify robbing God of time talent and treasure. And we do it because we are “too busy” with other things. 3. He follows the example of His father. He knew his Father was wrong in spiritual matters but he followed His pattern in political matters. Somehow, he thought he could compromise in one area of his life and it would not effect the other areas of His life. Warning… There is is no difference between sacred and secular. 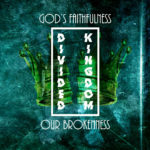 You cannot divide your life and only allow God to have control of only one part but not the others. God want control of all of life, and a small compromise in one “little” area is not little to God. It worked!!! This is pragmatism. The ends justify the means. In fact Asa does not even just get relief, he gets Baashas resources as well. There is a great lesson here. So many times when we rely on ourselves and our own resources, things seem to go well for a season. But things are not well when we have stopped hoping in God and started hoping in what we can accomplish. Now, many people in the world judge actions by their immediate results. If a Christian does a wrong thing, and it prospers, then they conclude that God wanted them to do it. They justify their actions even when they know it is not right. How many of us have done that? I have! This is a poor, blind way of judging our actions and the providence of God. Don’t forget the devil has a plan for your life as much as God does. Here is the scary part. Never once does he pray to seek God’s help. How does a guy this good become so bad? He became competent. He had the resources and so he just went out and did it. No need to wait on God. No need to pray for direction. No need to seek his blessings. Why pray when you can buy. Why seek God to meet our needs when we have MasterCard. The consequences of following the path of Asa is we miss tremendous blessings and we bring unnecessary hardship on ourselves. But God is faithful even in our brokenness. And God send s what to Asa? A prophet with His word. Because you sought your own escape, you will now suffer with war for the rest of your kingship. I would have given you Aram and the other kingdoms around you if you just trusted me. But now you will be at war from now on. God would not only have protected Asa from Baasha and Israel, he would given the entire Syrian army into the hand of Asa. But Asa threw it away by trusting in money and intrigue instead of God. 2 consequences of Asa’s failure. He missed God’s blessing – God would have delivered those Kings into His hand. He experiences hardship – Remember up until this point He has had 28 years of peace now that is all gone. Now we know from other Scriptures (e.g., Romans 8:28) that if we repent after such unbelief, God is faithful to take even those consequenses of hardship and turn them for our good! God can use them to be fatherly discipline, not judgmental condemnation. But it seems that Asa never did that. He carried these mistakes with him to the grave. Asa is so angry he throws Hanani in prison and begins to take persecute the people. When we are confronted with our sin, we have two choices. To respond as a loving rebuke or to get angry, bitter and lash out at those around us. Asa picks the second. He blaims His issues on everyone else. He is the victim, he has the right to feel this way. His arrogance and pride becomes the very thing that keeps Him from seeking God. 39th year he is afflicted with a disease in his feet. We do not know what this was. It could have been gout, degenerative osteoarthritis, or peripheral vascular disease. I have never had major problems with my legs and feet. That being said when I try and get into shape, I usually have problems running. There is nothing that is more frustrating than issues with your feet. It saps any motivation you might have because the pain is constantly with you. Notice how far he came. Even in his illness he did not seek the Lord. He trusted in man more than God. He suffered with this disease for 2 yrs and then He died. What a sad ending to His story. How to keep from Asa’s trap. Remember what God has done for you. He has paid it all! Asa forgot the past blessings and provision of God. God comes first then our resources. If we get that order wrong we will eventually turn down the path of Asa. Asa missed God’s blessing and experienced hardship. What about you today? I have not done this for a long time but I think it is important. I want to close up our time together with an invitation. Are you going through something right now and you need someone to pray with you? Maybe you have been trusting in your own abilities, and God is speaking to you right now that you need to release it to him. Maybe you have been holding something back from Him and you have been compromising in an area of your life and God is convicting you to deal with that. I know it is uncomfortable, I know it might seem weird, but don’t let the enemy keep you in your competence. He might be saying, you can handle that on your own. You don’t need to do that. That is the enemies lie to keep you from experiencing the blessings and provision God has for you. He wants you to suffer the hardship of not dealing with your stuff. This is a safe place. I want to open up an opportunity for you to deal with this stuff and be released.